Hedsperus - Original gouache on paper, framed. Paintings in gouache on paper of Emigrant Ships and contemporary working vessels by this highly talented Aberdeen artist. Rob trained as an architect in Aberdeen, working in Scotland, Czechoslovakia and South Africa. A family link to the Buckie fishing fleet probably started the steady interest in maritime subjects, though the first proper exhibition of paintings didn't happen until 2006. That was an exhibition of fishing subjects past and present. That was the point at which painting became a livelyhood because work was seen by Subsea 7 (a major offshore support and construction company and fleet owner) and an on-going relationship was established. Two calendars followed and as well as commissions for special events. Aberdeen's Maritime Museum has hosted exhibitions of offshore vessel portraits and fishing subjects. 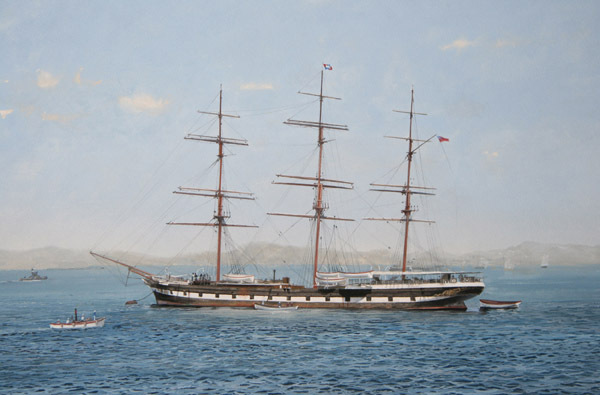 The Maritime Museum and the Lighthouse Museum own prints and paintings. 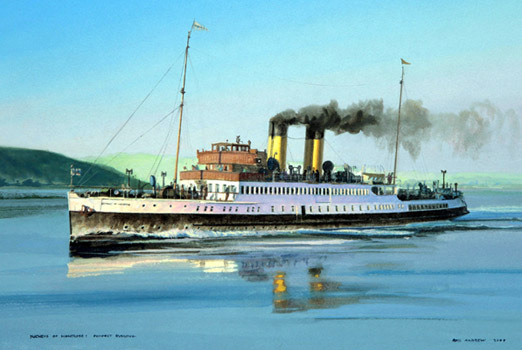 Commissions for offshore support and construction vessels have dominated the portfolio but subjects have varied from 1880s steam, to contemporary cruise ships. All the same, particular pride is taken that vessel portraits have been presented at ship naming ceremonies and are now at sea around the world. With commissions from BP, Subsea 7, PDI, The UK Sea Fish Industry Authority, Seasafe Nautica, Westward Fishing and Trawler Photos, Rob's work hangs in offices from Aberdeen to Houston and Manilla and in private homes from Den Haag to Johannesburg, but those afloat on bulkheads have given most satisfaction.